Yes, Mickey Mouse and the entire Disney crew could not resist coming to Hawaii’s magical kingdom. We welcomed them with Aloha and open arms and we welcome you as well! Disney’s Aulani Hotel & Resort is located in the beautiful Ko Olina resort which is on the west side of Oahu, also known as the Leeward side. It’s approximately 20 miles from Honolulu International Airport and a nice drive away from a fun filled paradise vacation destination. 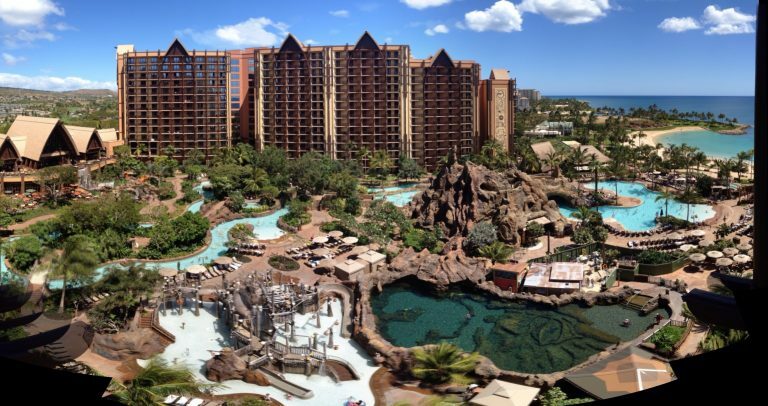 Aulani Hotel & Resort is a perfect family vacation destination here in Hawaii for obvious reasons. A not so obvious experience that most people overlook when making their way to Disney’s Hawaii resort, is the beautiful drive that welcomes visitors such as yourselves. Make the most out of your transport to and from Aulani hotel with a luxury private limo service with us, Hawaii Car Service. Treat your family to a nice, wonderous, and anticipating ride to the Aulani upon arrival in cool, calm, comfort. It’s a great way to begin your Hawaii vacation with Mickey. Or, take a limousine service to experience the rest of what Oahu, Hawaii has to offer. Travel in luxury to Waikiki, for some retail therapy, sightseeing, and/or go on our first class Oahu island tours to Pearl Harbor or up to the North Shore. Whatever your heart desires, we are here to serve your transportation needs while here in Hawaii. We offer a wide array of a private limo and black car services for just you, or for an entire crew. Our professional drivers and fleet are able to accommodate for your Hawaii transportation needs and wants. Custom tailor a limo service to and from the Aulani Hotel, or where ever it is you would like to go to. In any case, we look forward to connecting you to your magical destinations here in Hawaii.